I love reading poetry and creating poetry with kids. I’m always amazed at the freedom that many kids feel when they express themselves through poetry and give themselves permission to abandon some of the “rules” we must follow when we write in other forms. While there are many “rules” in poetry too, I’ve noticed that many kids aren’t intimidated by writing a poem when they realize that poetry is painting a picture with words and not necessarily writing in a complete sentence. I’m happy to work with students on poetry all year round, but we of course do our fair share of lessons in April for poetry month. 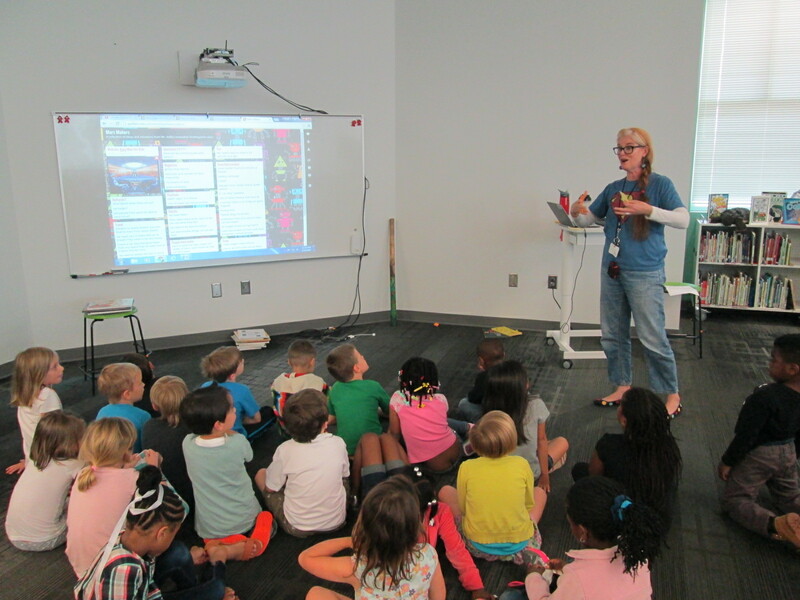 Recently, Ms. Lauren’s Kindergarten class came to the library for an introduction to poetry leading up to our annual Poem In Your Pocket poetry cafe. Then, we read the book. We paused along the way and paid attention to the language. I wasn’t specifically focusing on similes with them but instead just noticing the unusual descriptions or the vivid descriptions. 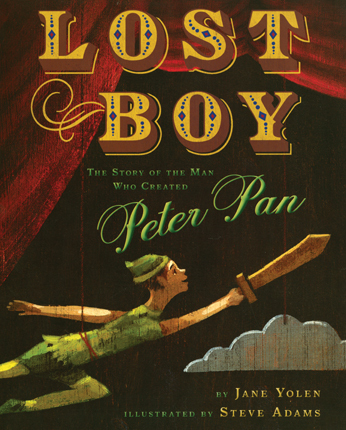 Following the book, we revisited our list. I asked them, “How can we take each of these things in our list and make it more vivid or unusual?” Students took turns offering suggestions. Sometimes we went with the first thing a student said, and other times we listened to several suggestions before deciding what to add. I let the students come up with the words, and I wrote them for us on the board. To close our time, we read the poem twice. First, I read it aloud, and then we did a choral reading. Now, many of these students want to go back into the classroom and try writing their own color poetry modeled after this one. This time of writing really seems like magic to me. Students come in with a blank screen in front of them and we unite our minds and voices to create something together as a community that just seems to spark when it is spoken into the air. We did this without any fancy technology or bells and whistles. It was just us, our imaginations, an inspiring text, and a dry erase board and marker. What poetry magic have you created this month? Students in 2 Kindergarten classes have been hard at work researching American symbols as part of their social studies standards. Doing research projects with the youngest learners in our school doesn’t look like it does in the upper grades. We think about what some of the biggest barriers might be for our young creators and put pieces in places to support students in getting over those barriers. First, students chose one of four American symbols to research: American flag, statue of liberty, liberty bell, and bald eagle. 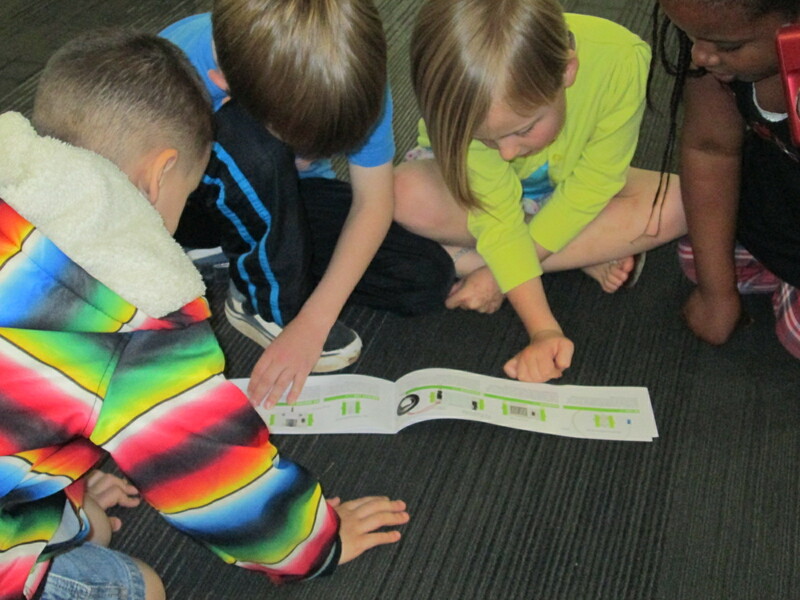 In the library, we introduced students to a graphic organizer for collecting 3 facts about their chosen symbol. I learned from another Kindergarten teacher a few years ago during research to set an expectation that allows all students to succeed or exceed during the first research session. We asked students to have a goal of writing at least one fact during the first work session, but if they still had time, they should keep going. Students used Capstone’s PebbleGo for their research. 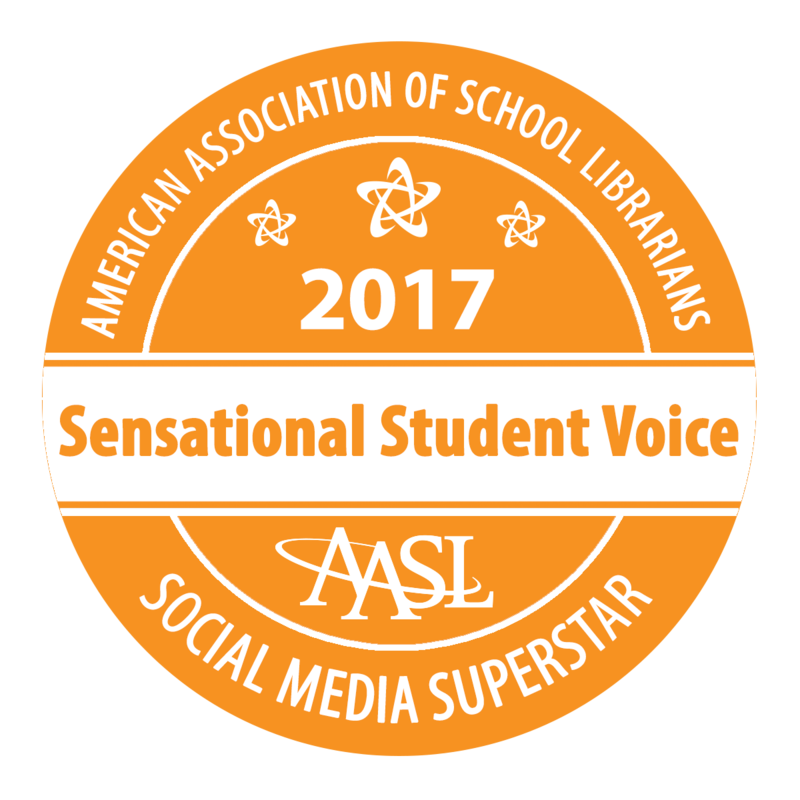 We love this database for many reasons but mostly because it breaks information down into manageable pieces and reads the text in a human voice for students. I modeled for students how to listen to a portion of the text and then think about what they had learned by listening. Then, we talked about what we would write on our organizer. This modeling was done with a different American symbol than the one students were researching. At tables, I setup computers for students to use in pairs. We chose pairs because it gave students one more source of support as they worked. Also at each table, we tried to place an adult for support. The teacher, classroom paraprofessional, and me all worked at tables. If a parent volunteer or student teacher was available, they stayed at the 4th table. Otherwise, the adults took turns checking between tables. We found that we had to continue modeling for students how to listen, ponder, and then write rather than just copying a sentence off the screen. However, some students still chose a sentence to copy. All students left with at least one fact but many left with 3 or more. After this initial work session, students continued their research in centers in the classroom. Then, they returned to the library for another work session in small groups. Each group came for 15-20 minutes. We did a short tinkering session with Chatterpix Kids to see how you can take a picture of something, draw a mouth on it, and then record that picture talking. 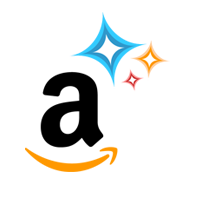 Ahead of time, I chose creative commons images of the symbols for kids to use for their pictures. Rather than having every student create their own Chatterpix, each group created one Chatterpix video with the iPads. Each student chose one fact from their research to read. Before recording, students chose their fact. We decided the order students would read and practiced a few times. Students helped take the picture of the symbol and draw the mouth. Then, we pressed record and passed the iPad to record. If we needed to record a few times, we did. Then, we uploaded our videos to Youtube and created a playlist to share with the class, families, and you. I hope you will take a moment to listen to their work. I love building foundations of research in our early grades and seeing where these students end up by the time they are in 5th grade. We have a lot of work to do, but we celebrate the work of these Kindergarten students and what they have created. Ms. Kelly’s Kindergarten class has been hard at work on an animal research project that is unlike any other I’ve been a part of. For the culmination of the project, students recorded an interview of an animal in its habitat using our green screen and the Do Ink app. There were many layers to the process that students went through the create their final product. The class has been to the library throughout the project to initiate various pieces and then moved forward with the project work in class. 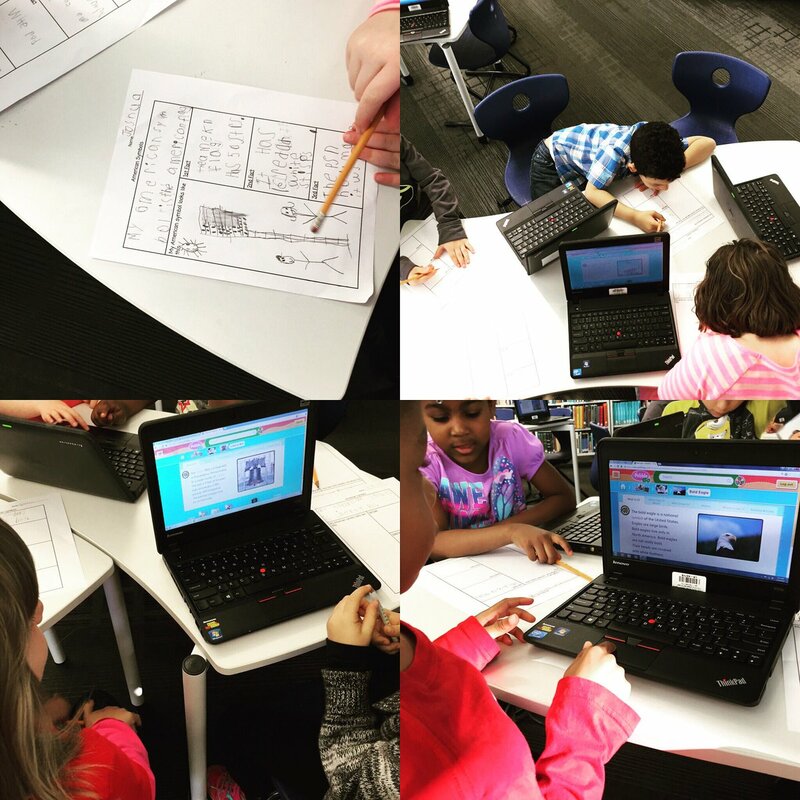 It’s hard to even go back to where the project began, but eventually each student came to be in one of 4 groups researching an animal of interest: crows, sharks, spiders, and alligators. Students checked out both fiction and nonfiction books about their animals in the library during one piece of the project. During another piece, students spent time researching their animals and gathering facts. In another lesson, students came to the library to talk about crafting great interview questions. We looked at the Story Corps great question generator and practiced interviewing one another in a way that would elicit extended responses from the person being interviewed. Students took this skill and went back to class to write questions that they would ask to their animals if they were doing an interview of the animal they researched. Using their research, they thought about the answers to their questions. In another session, students came just to learn about how the green screen worked. We watched a tutorial video from Do Ink as well as a video that had been made on our green screen. Finally, students came back for one more work session in the library to prep for their interview project. This was a work session because students were in all kinds of stages of their completed project. The teacher, parapro, and I all worked with groups of students at the point they were at. My group was getting close to ready for use of the green screen, so we took some time to experiment a bit with what students hoped to do. Instead of a static picture of the animal’s habitat, students wanted a video of the habitat. We searched creative commons Youtube videos for nature scenes that matched where an animal would be found and used the iPad to record snippets of those videos. This helped us think about what we would need to accomplish before recording. Back in the classroom, students made final preparations for their animal interviews. They made props. They wrote our their script on cue cards and assigned parts to each person in the group. The teacher made copies of these cards for students to practice with in class as well as sent them home for weekly homework practice. Students also decided exactly what they hoped to have a video of for the background of the green screen. The teacher sent these to me in advance, so that I could pull some videos from Youtube for us to use. Each group came individually to the library to record. We did a practice run of the script. The teacher held the cue cards and I ran the iPad. I flipped the screen so that students could see themselves as they talked. This helped them know to be in the right place, but it also tempted them to wave at the camera and make faces. Once students finished recording, they had a chance to watch their video back. I uploaded the videos to Youtube so that we could share them with families and authentic audiences. I encourage you to take a look at the work. Pulling off Kindergarten projects like this takes some creative thinking. Anytime that we can break the project into pieces, work in small groups rather than the whole group, and do recording within single groups makes the project run much more smoothly. 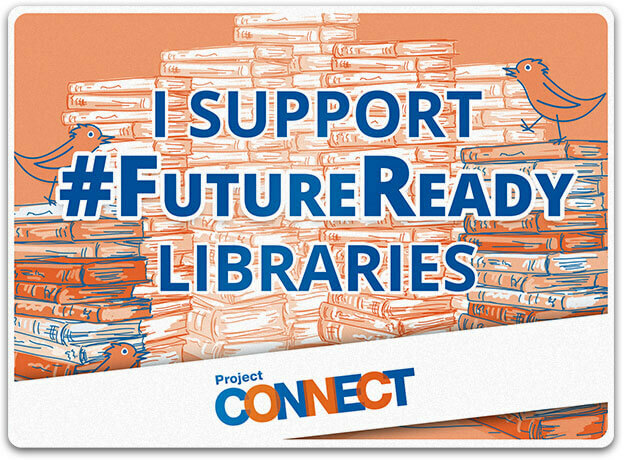 I also love when a project flows in and out of the library and classroom. Ms. Kelly is an awesome teacher to collaborate with because she finds so many connections to the standards students are working on but also weaves in student interest and expertise. She dives into a project and trusts that along the way she is going to realize just how many standards a project based in student interest and curiosity can actually included. She also thinks about how to reinforce the project so that students are fully prepared before jumping in to creating the final product. I thought it was genius (and time consuming) to create so many cue cards and give students copies to practice for homework. I’ve been doing several technology computer projects lately, and I’m so thankful for the flexibility of our schedule so that we can get creative with how to break the projects down into pieces as well as smaller groups. Bravo Kindergarten for another awesome project. For the past few weeks, 2 classes have been involved in exploring winter right here in Athens, Georgia. Even though we might associate cold and snow with winter, it isn’t always like that where we live. Ms. Kelly’s Kindergarten class and Ms. Ramseyer’s 2nd grade class both participated. You can read about the beginnings of their projects here. Our work is all coming together with classrooms from around the world on a collaborative Google slide presentation. Ms. Kelly’s class has been busy in their classroom dividing into groups and building a song about winter. As a class, they worked on the base beat using beatlab. Then different groups worked on parts of the song. Singers created the words and sang them. Clappers used their hands to add rhythm. Ukuleles strummed chords for another layer. Instruments such as coffee can drums added even another layer of rhythm. Ms. Kelly wrote the words up onto a big chart paper with plenty of visuals for students to follow. She saved their class beat in beatlab and pulled it up on the library projector. I used Screencastomatic to record the beat along with our webcam recording the student performers. Ms. Kelly used dry erase markers to make notes on the beatlab beat for specific groups of students. She also used a cowbell and her voice to help students know when to come in. We gave ourselves plenty of time to record multiple times, but we just loved our first take! Even though we were in love with that version, we decided to try one more time with just an iPad so that we could get some closeup shots of students performing. 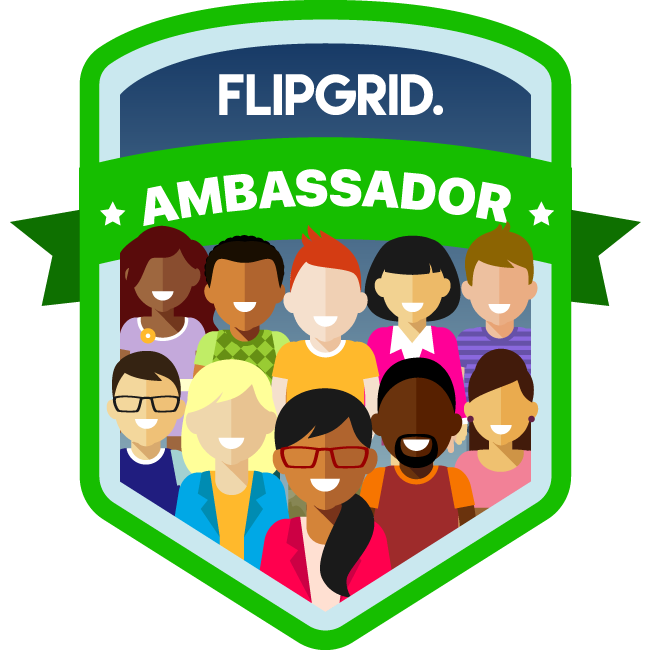 We love this version too, but we are including the 1st one in our global winter project with classrooms around the world. We had some fun shout outs while we were working on our song, including some retweets from Kishi Bashi who was one of our inspirations for our song. @plemmonsa @CantataLearning I want to hear this one! Love the red guitars! What a fun project. Ms. Ramseyer’s 2nd grade class split into groups of 4. Two students were author and two were illustrators. After starting their work in the library, they continued to write and draw in class to tell about personal experience with winter in Athens. They featured things like food, clothing, school, and events in winter. Each group came to the library with their finished work. We spread their pages out on tables and took digital pictures of each page. We then took these and added them to the collaborative Google presentation. In Youtube, we pulled up the feature where you can record straight into Youtube with your webcam. We placed each page in front of the webcam and students read their winter personal narratives and facts. These videos were also embedded on the Google slides. We look forward to seeing how the rest of the slides turn out as we learn about winter around the world! 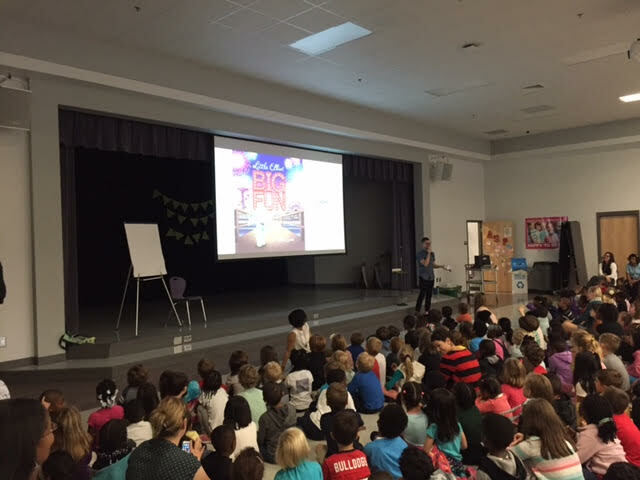 We have been excited since the very beginning of this year about author/illustrator Mike Curato visiting our school. Thanks to Henry Holt, a division of Macmillan, and Avid Bookshop, our local independent bookshop, Mike visited all of our Prek-2nd grade classes. We all read Little Elliot, Big City during library orientation this year, so we were super excited to meet the person who created it. On field day, students created a massive window display of Little Elliot and cupcakes. They worked for 30 minutes designing their own special cupcake. 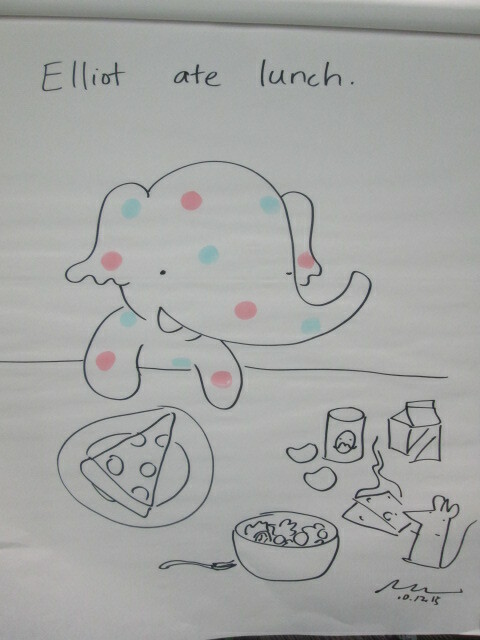 They also added dots to a collaborate Little Elliot. 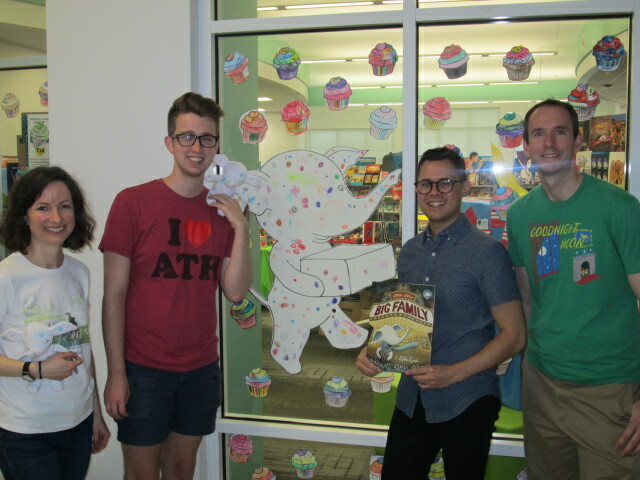 Many volunteers worked to get all of the cupcakes and elephants onto our windows to celebrate the author visit. The display has been so much fun to look at and watch students searching for their dots and cupcakes. It was a busy time at our school during the visit because it is also our fall book fair. Instead of having our visit in the library, we moved everything to the cafeteria stage. Students enjoyed a reading of Mike Curato’s new book Little Elliot, Big Family. Mike had the book’s pages displayed on the large screen so that students could easily see what he was reading from the book. They were mesmerized by the story and were such careful listeners. After his story, Mike shared some slides and stories about how he works as an author and illustrator. Students saw sketches beside finished artwork as well as a time lapse of a drawing being created. He also showed students pictures of how Little Elliot has changed through the years. He has been drawing him for several years, and he has gone through some changes along the way. We also saw sketches of some of Mike’s early artwork, which was a wonderful connection for our young learners to see how work they are doing right now could inspire a future career or hobby. Students even got to see the cover of next year’s Elliot book Little Elliot, Big Fun. Next, Mike worked with the entire room to create 3 pages of a new story. He wrote a sentence to start the story: “Elliot went to school”. 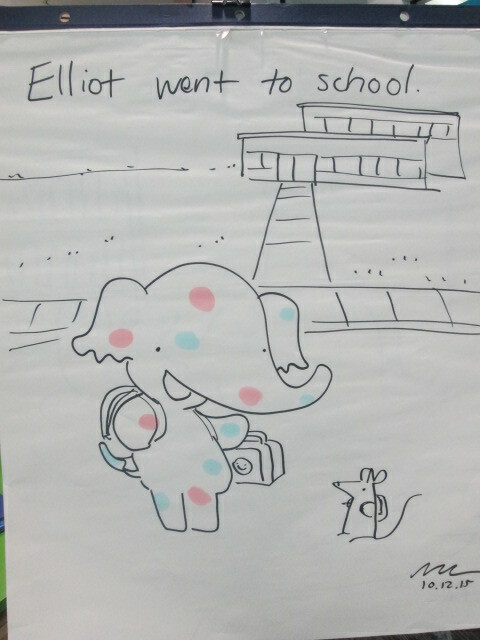 Then, he drew Elliot on the page and let the students take it from there. They suggested things to add to the picture and Mike added them in. For the next 2 pages, Mike took suggestions from the audience about what Elliot should do. Students decided he would read a book and go to lunch. Once again, Mike added details to the drawing that were suggestions straight from the audience. 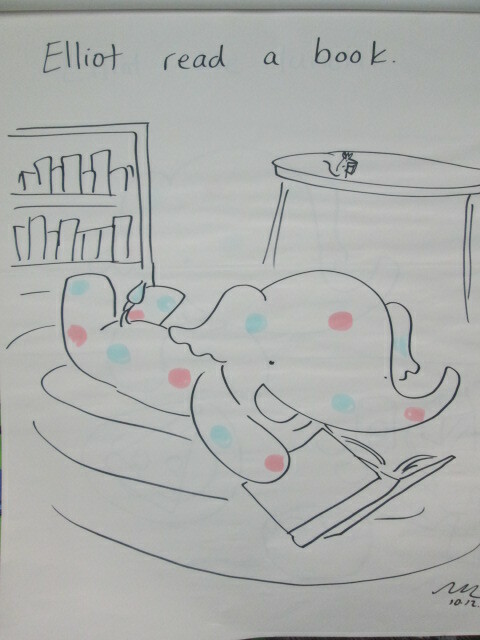 The best part was that we got to keep the 3 drawings to enjoy in our library! Finally, students got to ask questions. Mike jumped right out into the audience with the students to take their questions and give thoughtful answers. The kids were so attentive during the whole process. Before Mike left, he took time to sign all of the books purchased by students. Our incredible PTA bought a copy of each book for every PreK-2nd grade classroom, so he signed those as well. He also took time to look at the big window display and marvel at the students’ creativity. If you ever get the chance to have Mike Curato at your school, don’t hesitate. He was wonderful and the kids and teachers have talked about it all day. Be sure to check out both of his Elliot books, add them to your home and school collections, and enjoy the many positive messages that your sure to take after reading the books with kids. Thank you Mike Curato and Avid Bookshop for a wonderful day! We can’t wait to reconnect once the Polka Dot Express arrives at our school soon! I have to take a moment to brag on another teacher and group of students in our school. Kelly Hocking is an amazing Kindergarten teacher, and she has a talented group of Kindergarten students who are some of the biggest researchers and creators in our school. I love how each year she finds something that her class takes an interest in and somehow weaves into every subject area and standard that they study in Kindergarten. One year it was art. Another year it was a study of maps and stretching the imagination. This year it was space. Kelly never knows at what point in the year something will pop up as an interest in her class, but this year it happened when they were doing a GoNoodle. It happened to feature space, and it took the class into a series of questions and wonderings about space. They started reading lots of books about space as well as studying the science standards about the day and night sky. The more they read, the more they started to notice about space popping up in so many areas of their curriculum and life. They launched into research mode and asked lots of questions. In the library and classroom they used print and digital resources to learn about the planets and collect facts about each one. In February, the class celebrated Fat Tuesday by dressing as planets and parading around the school. Each costume was space-inspired and they handed out coins and beads to lots of classes. 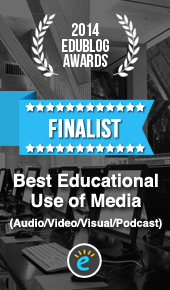 Research continued in the classroom and the media center. Students used all of their facts to write a series of notes. In groups, the students put those notes in an order that made sense and prepared to make their own ebooks about space using the Storykit app. At this point, we were approaching poetry month, so I suggested that the students think about space poetry. I connected the class with several poetry books about space, and they started crafting some poems in class. Ms. Kelly also has ukuleles in her classrooms, so the poems eventually were turned into songs with music composed by the students. At our annual Poem In Your Pocket day, the groups of students performed their poetry songs for a live audience. We even had poet, Laura Purdie Salas, listen in to the poetry since students were inspired by her space poems and songs. At this point in the year, lots of attention turned to Mars and space exploration. Students really didn’t want to travel to Mars themselves, but they did want to think about helping other people get there some day. 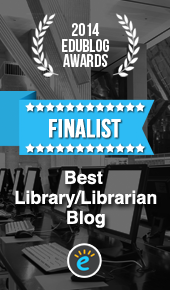 We created a Padlet to collect all of our research in the library and the classroom. Eventually, the students wanted to start making some inventions to help Mars explorers, so we did a lot of tinkering in our Makerspace. In class, students constructed elaborate prototypes of their inventions and did informational writing to accompany their creations. If we had more time in our year, I’m sure Ms. Kelly and her students would have come up with even more miraculous things, but it truly was an amazing year of exploration and I’m glad that our library was a part of it. Can a Foodini 3D Printer Go to Space? Also, you can view Ms. Kelly’s full deck of slides which includes lyrics to a cumulative song that explores all of the planets and the facts the students learned. They performed this song at our end of the year assembly. View the full slidedeck here. Ms. Kelly’s Kindergarten class has turned a curiosity into a year-long project. They became interested in space, and it has turned into a research project about planets, creating planet ebooks, writing original songs about the planets using ukuleles, and having a Fat Tuesday parade dressed as the planets. Now, these students are on a mission to figure out how to support human travel to Mars. They don’t actually want to go to Mars themselves, but they want to think about what might need to be invented in order to support human travel to Mars in the future. Wow! Some might look at a Kindergarten class and think this is silly. How could students as young as Kindergarten come up with ideas for traveling to Mars? I think Ms. Kelly’s class proves that even our youngest voices should not only be listened to but empowered as well. These students have spent extensive time researching Mars. They know about the land, the weather, the atmosphere, and ways that Mars has already been explored. They have brainstormed things that they might need to think about when traveling to Mars such as water, food, oxygen, and how to survive the dust storms. They recently came to the library to read the book You Are the First Kid on Mars by Patrick O’Brien. She and I brainstorm a lot over email. When working with her, nothing is impossible and our biggest limit is time. She wanted a way to capture all of her students’ brainstorming, so I suggested a Padlet since they could post ideas, websites, pictures, and files. I set one up for her and they got to work adding to it. Within their brainstorming, they talked about creating robots that could help them explore Mars as well as several other technology-heavy ideas. This brainstorm naturally brought us to our library makerspace. We wanted students to have a time to explore some facts about robots, technology, electricity, circuitry, energy, and space exploration. Ms. Kelly books an hour of time for student to explore, and I created some experiences for them to move through. 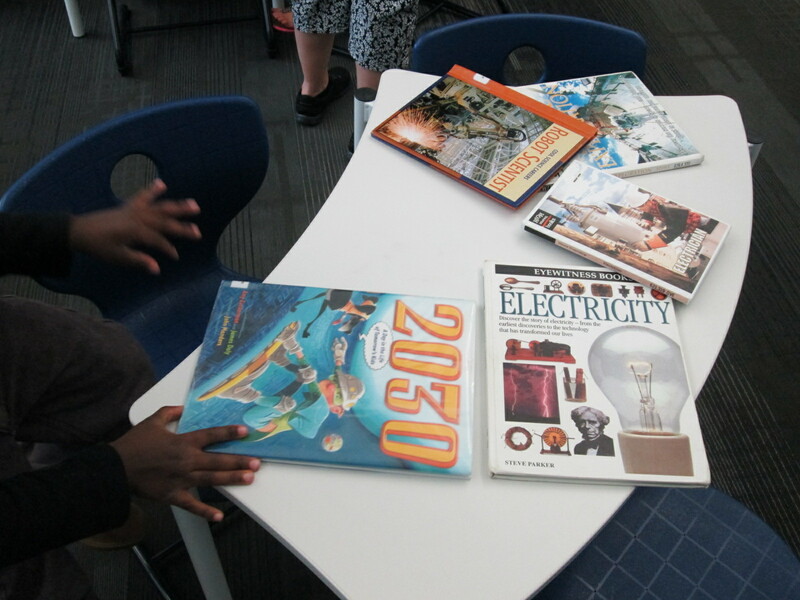 I pulled as many books as I could find on all of our major maker concepts from 3d printing to robotics to circuitry. I also pulled books about space. This experience was a time for them to look at lots of pictures, read captions, and skim text with one another and an adult to get ideas that they hadn’t even thought of in their brainstorm. We have several robotics options in our makerspace. Since robotics was part of their brainstorm, I wanted them to tinker with a robot that was manageable by a Kindergarten student. I chose Sphero. Since Sphero alone couldn’t do some of the things they were thinking of robots doing, I showed them a Youtube video of how Sphero can be combined with other things like a chariot to pull a camera or add an attachment. Then, students used the Drive app to practice driving Sphero and brainstorming how this might help them explore Mars. Students have talked a lot about wiring and circuits during their brainstorming. They really want to wire something that could actually work. I have 2 littleBits space kits which have instructions for creating things like Mars Rovers, Grapplers, and Data Collection Tools. The age range is high for these kits, but age range never stops us from trying something. We just look at what barriers are in place and then figure out how to build a bridge. For this experience, I started students with the instruction booklets. They got into 2 smaller groups and looked at the diagrams, instructions, and functions. They started to think about their brainstorm and how these littleBits inventions might work with their ideas. Then, they moved to a table of littleBits. In pairs, they used a battery, power cord, and blue power switch to connect to one input (pink) and one output (green). The idea was just to start tinkering a bit with littleBits to see how they work. They weren’t necessarily making a space invention yet. Next, our students will go back into their classroom and continue working on their padlet using the ideas from the makerspace exploration and the books. They also checked out some of the books to take back. Then, students will begin constructing prototypes of tools that they might actually invent for space.